4.3-inch TFT LCD monitor, broadcast quality, color and B/W video applications, high resolution, high brightness LCD panel. Durable black anodized aluminum body with protective anti-glare glass. Slim and lightweight- perfect for field mobile and fixed monitoring applications. Dual composite video inputs with built-in active video loop-through. 1/4-inch mount on bottom. 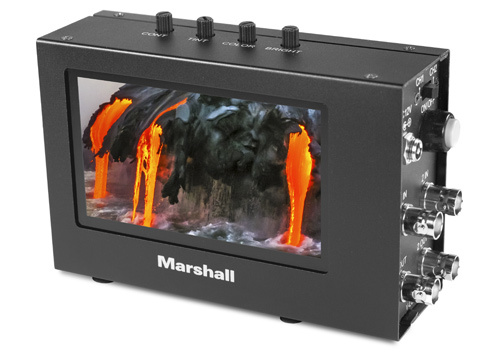 The LCD4.3-PRO-R is a 4.3-inch TFT LCD monitor providing broadcast quality picture for color and B/W video applications. New high resolution, high brightness LCD panel delivers high quality picture under various lighting conditions. Monitor case made from durable black anodized aluminum with protective anti-glare glass in front of LCD panel. Its slim (1.8") and lightweight (0.8 lb) design makes it ideal for field mobile and fixed monitoring applications. Dual composite video inputs with NTSC/PAL auto recognition and built-in active video loop-through using professional grade BNC connectors. Monitor has a 1/4-inch mount on case bottom.